Whether you realize it or not, when you take out a mortgage you wind up paying a lot of money in mortgage interest. And that’s probably an understatement. Generally, we’re talking hundreds of thousands of dollars over the full 30-year term of a mortgage. This is the price we pay to leverage and avoid buying with cash. In fact, interest is often the largest component of your monthly housing payment, at least for the front-end of your mortgage until principal finally gets paid down at a faster rate. Aside from snagging a lower mortgage rate, there’s another relatively simple way to save money on mortgage interest if you’re eligible. I’m referring to a “mortgage credit certificate,” or MCC for short. Put simply, an MCC allows home buyers to claim an annual federal tax credit for mortgage interest paid throughout the year. Let’s look at one example from the California Housing Finance Agency (CalHFA). On a $200,000 mortgage set at a 5% mortgage rate, the total interest paid during the first year would be roughly $10,000. The mortgage credit certificate would allow this hypothetical homeowner to get a straight up tax credit (not a deduction) for a percentage of that total interest paid. Typically, an MCC will give the homeowner a 15% or 20% credit, so in our example, the annual tax credit for year one would be $1,500 or $2,000. This amounts to monthly savings of anywhere from $125 to $167 a month, which aside from making life a little easier, may allow you to qualify for a larger mortgage. The MCC savings can be added to available monthly income to qualify borrowers for larger loan amounts. If you don’t need a larger mortgage, you can simply take advantage of the tax benefit the credit offers. And it’s good for each year of your mortgage, though the benefit will decrease over time as less interest is paid. The way mortgage amortization works, payments start as mostly interest and eventually become mostly principal because the balance grows smaller over time. What’s also helpful about an MCC is that the homeowner doesn’t need to itemize taxes to take advantage of the benefit. This differs from deducting mortgage interest. While it’s clearly a great benefit, a lot of taxpaying homeowners probably don’t see any relief because they don’t write off enough stuff and simply take the standard deduction instead. However, if you do use a mortgage credit certificate, you can only write off the remaining mortgage interest that isn’t part of the federal tax credit. So using our example from above with a 20% credit, you’d get a $2,000 federal tax credit and the remaining $8,000 could be an itemized deduction to reduce your taxable income. 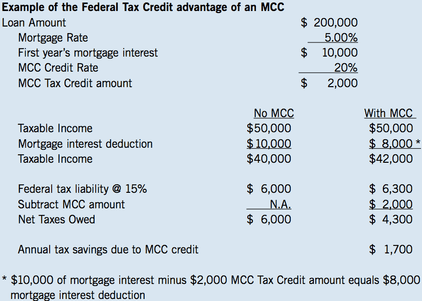 As you can see, the MCC would reduce the hypothetical borrower’s overall tax bill relative to only taking the itemized deduction for mortgage interest. And by a decent amount too. Keep in mind that not everyone is eligible for an MCC. To be eligible, you need to be a first-time home buyer. That means you haven’t owned and occupied your own home in the past three years. There may be exceptions if the property is located in certain designated areas, or if you’re a veteran. You’ll also need to occupy the home you’re buying, so no second homes or investment properties. There are also income limits and purchase price limits to ensure the credits go to those who need them most. Just keep in mind that there is the potential for a “recapture tax” if you don’t meet certain conditions associated with the MCC. And it can be fairly costly. Generally, no recapture tax is due if you sell your home after nine years. Note that a lot of people move in less than nine years. But even if you do move earlier, the recapture tax can be avoided if you sell without a gain or if your household income remains within certain federal limits. So it’s certainly avoidable, though something to strongly consider as well if you’re thinking about applying for an MCC. You should know all the risks and rewards before diving in. As with anything else tax-related, you should contact your tax advisor or CPA to determine what makes sense in your situation. 1. I read somewhere if 20% of my interest paid in an year is over $2000, I will get $2000 not any more, is that true? 2. Also when I closed on my loan early Jan the interest rates were high but now they have gone down and I am getting 0.375% lower rate with no closing cost. But the lender is not MCC approved. In my case if I refinance and lose MCC eligibility will I still need to pay recapture fee? I am assuming no as I have not taken any advantage of the program but still wanted to know your comment. 3. Also the recapture formula looks very complicated will be able to give us an example how it works?